We wonder just how much force the anchor will get if we load it right up with this short scope. With our previous tests we believe our engine will simulate 30 knots of wind - but what about stronger gusts or lulls that allow the boat to build up momentum and jerk back harder? We decide to simulate this by jerking back on the anchor from a position somewhat forward then putting the engine in hard reverse. Sheryl will be on board and running the engine. This is not a precise test since the speed we attain in reverse will vary with each test. But it will make much greater forces than just running slowly up to full throttle astern. Sheryl will also try to estimate how this approximates to forces we have felt on the boat in violent squalls at anchor. We are anchored and the boat resting - chain hanging down - as Sheryl puts the engine in full astern. We develop some sternway and momentum before the chain comes up taut, bouncing our 36,000 lbs of boat back forward. 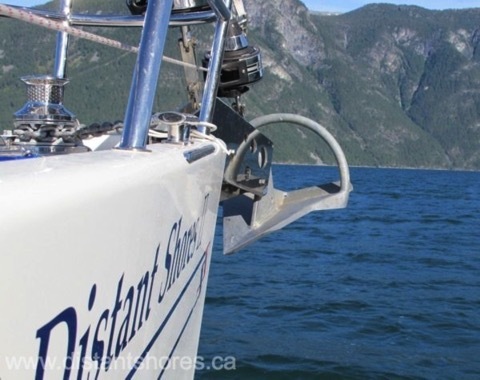 The force on the boat is quite impressive - Sheryl describes it: “The bow immediately snapped around to line up with the anchor and then the bow got pulled down from the force on the chain due to the anchor holding so well. It felt like when gusts of 40-50 knots whip the bow around”. Underwater I watch the chain lift up off the bottom. It is coming up at an angle that actually raises the shank a little. 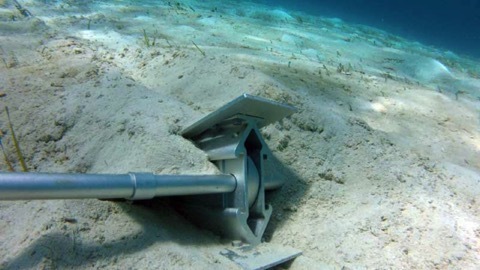 The anchor moves about 12 inches back and digs in deeper. I wonder if this would have been the same with our old CQR Anchor? It might have possibly pulled out and dragged - but the 73 lb Rocna held on well. Now Sheryl extends our scope to 52 meters - 52/14 = 3.7:1 so we are still less than 4:1 scope. We retest with a similar full power fast reverse and the bow snaps around again. The extra scope makes a big difference here as the shank doesn’t quite come up off the bottom. The anchor barely moves this time. 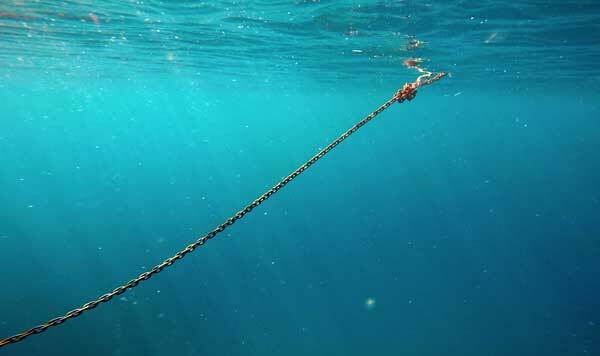 In normal conditions (not storm force forecast) an all chain rode will allow reduced scope in deep anchorages. 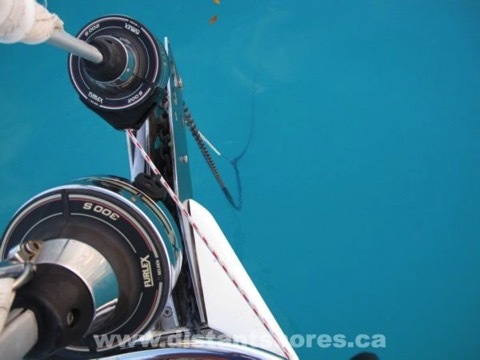 We find 3:1 scope to be OK for anchoring in 50 feet of water. Increasing scope to 4:1 or 5:1 will be better and would be a good idea if strong squalls were forecast. Even an increase to 3:5:1 will make the anchor more effective. 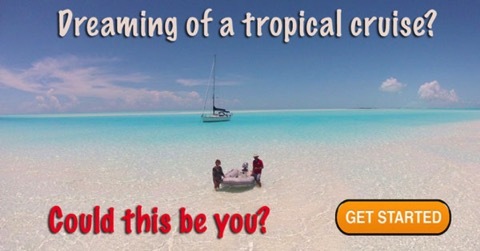 Do you ever wonder how to anchor in a crowded anchorage when the water is a bit deeper than you are used to? 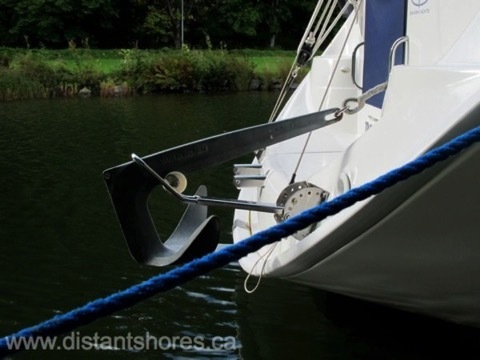 Do you sometimes come into a busy anchorage and can’t to find a place to anchor where you can put out the recommended 5:1 scope? Or do you sometimes arrive at an anchorage that is deeper than you’re used to and wonder if you have enough rode to lay out a 5:1 scope? In deep anchorages that are either small or crowded Sheryl and I occasionally need to anchor with shorter scope than we would like to. In these situations we have used as little as 3:1 scope. The question is “how bad is this really?” Are there situations where you don’t really need to have the recommended 5:1 scope? Standard “rules” say we need 5:1 scope and this is a good generalization for regular anchoring with an all-chain rode. But it doesn’t take into account the effect of having all that weight down when you have laid out a lot of chain in deep water. If we put out 165 feet of our 3/8” chain, we have got 250 pounds of weight in chain between our anchor and the bow of our boat. This forms a curve called a catenary curve - the weight of the chain pulling down the rode even when the wind is blowing strongly. So the chain near the anchor will hopefully be pulling close along the bottom - not lifting the anchor up. But just what is the effect of this and how much can we count on it to hold the boat in place? How much of a difference will it be to having the same scope in shallower water? In our test anchorage the wind is blowing 15-20 knots with gusty conditions and it is a busy but not exactly crowded anchorage. 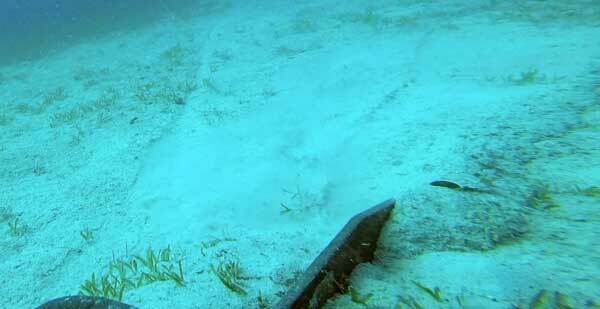 It’s deeper than normal - about 50 feet deep with a nice sandy bottom where we are anchoring. Our Rocna 33 anchor weighs 73 pounds. We have 275 feet of 3/8 G4 (G40) chain. So we set out 165 feet of chain and pull back to set the anchor. This means we have a scope of just 3:1. 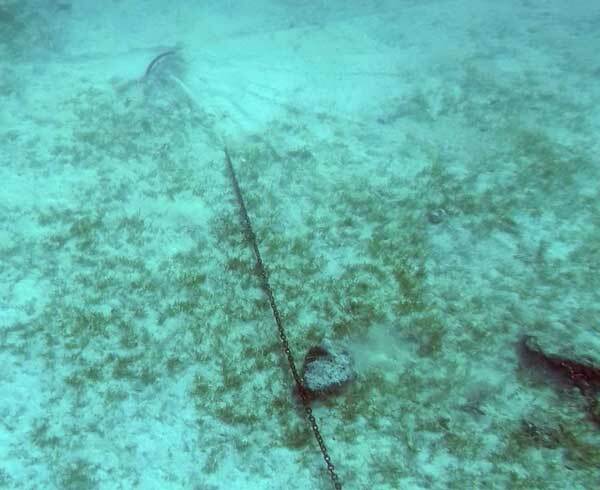 My goal with this setup was to dive down and see what the anchor looked like in these conditions. Would the rode be lifting up off the bottom or would the weight of the chain be holding it down on the sand? Here are pictures from our test - engine astern at 2500 rpm simulating winds over 30 knots. 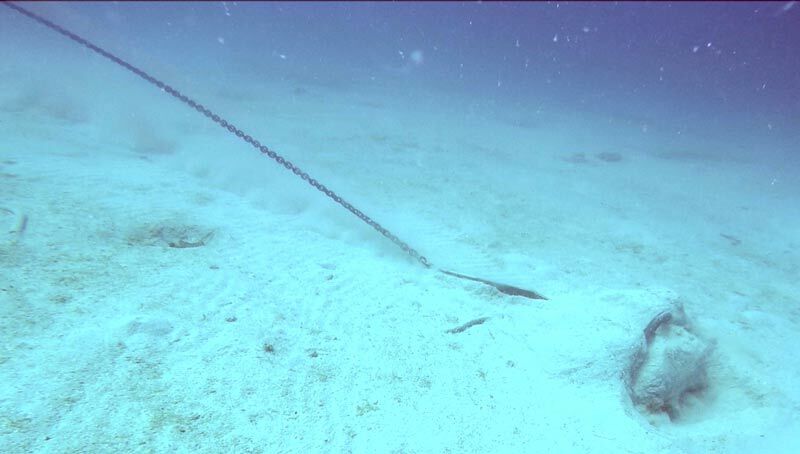 Although the chain enters the water at a steep angle this is the effect of the 250 pounds of chain. This is the effect of the catenary - the weight of the chain makes the 3:1 scope pull pretty much parallel to the bottom at roughly 30 knots of wind force. Note the chain is nearly parallel to the bottom. 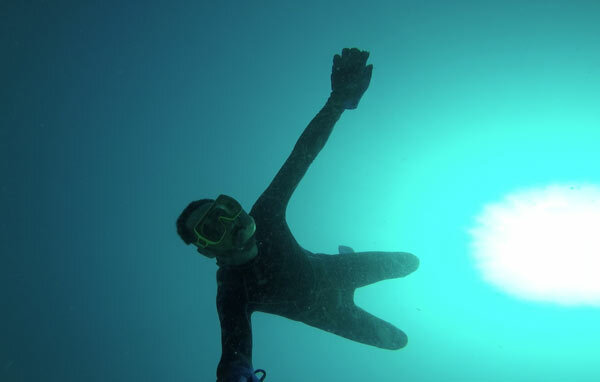 Paul dives down to take a look at it 55 feet underwater. The water is nice and clear for testing here in the British Virgin Islands. Rocna anchor set perfectly as usual... it is well buried and sitting right way up. Anchoring is a very contentious subject and also seems to differ by culture. 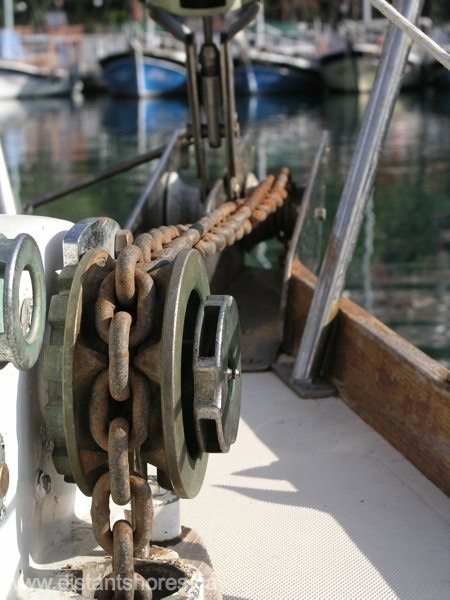 In North America many cruisers use a short length of chain with the rest rope. In this case the catenary method described here will not work - you need all-chain for this effect. 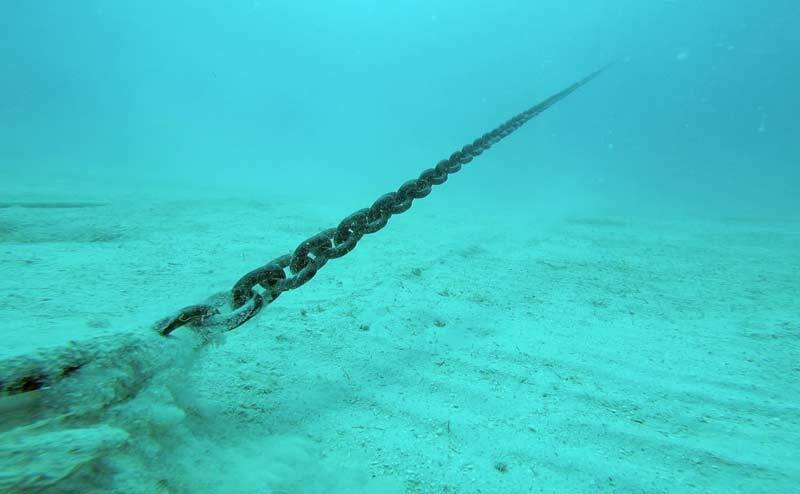 In normal conditions (not storm force forecast) an all chain rode will allow reduced scope in deep anchorages. 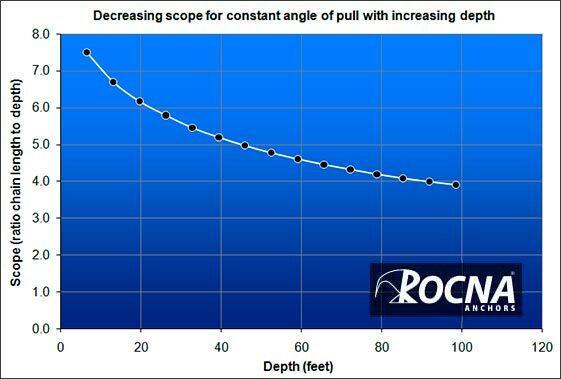 We find 3:1 scope to be OK for anchoring in 50 feet of water. Increasing scope to 4:1 or 5:1 will be better and would be a good idea if strong squalls were forecast. Even an increase to 3:5:1 will make the anchor more effective (see Part 2 Crash Test here). Use binoculars with a rangefinder (such as our Fujinon 7X50 binos) to judge neighbourly distance. Use GPS and Radar to plot nearby boats. Ask neighbours how much rode they have out to make sure you will not hit each other. 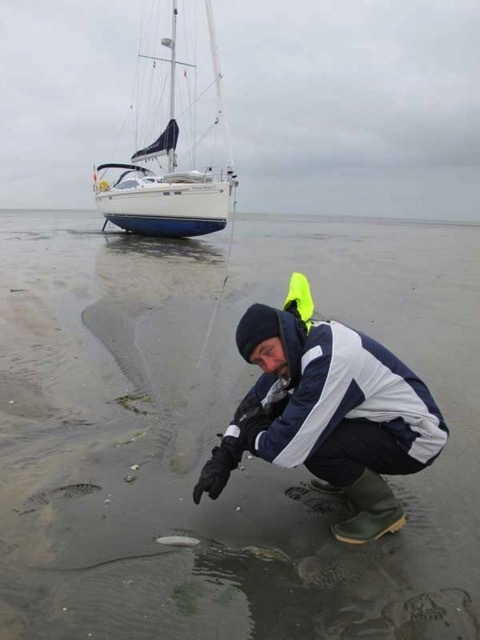 Go for a heavy anchor - in any given anchorage a heavier anchor will perform better than a lighter one. Catenary Calculator - give it a try! The past 2 days have been windy cold and miserable here in Annapolis. The boat show finished with great weather through the whole 5 days of the show. Now it seems like winter has set in!!! Brrr! We are anchored in a little creek and getting a chance to test out our anchors in the soft Chesapeake Bay mud. When we were here last year we had trouble in the mud - the only time we had trouble with our Delta 44 (20kg) in the 3 years we have had one. The Delta slipped 4 times in a number of Chesapeake anchorages. 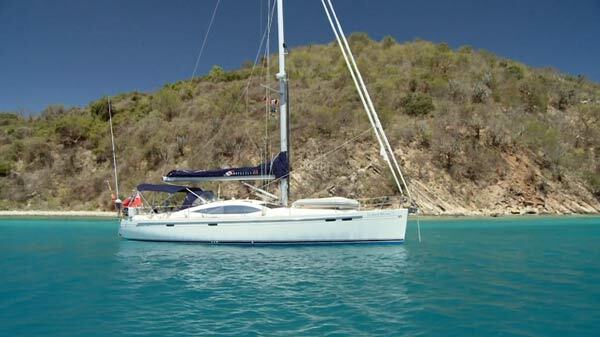 I think it is a good anchor but perhaps would have to be bigger for the Southerly 42. At any rate we took the opportunity to re-evaluate anchors and decided to try out the Rocna. 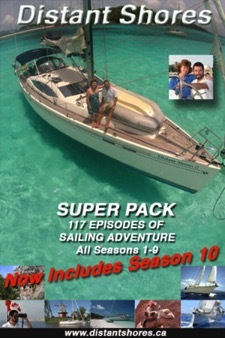 We got it in Moorhead City and have now sailed with it for one year, anchoring throughout the Caribbean and Bahamas. It has performed consistently well from sand to grass and some mud. Now we are back in the Chesapeake Mud that was a problem last year. Rocna 25kg on the right - note scoop shape and large surface area. So how did it do? The short answer is ... Excellent! 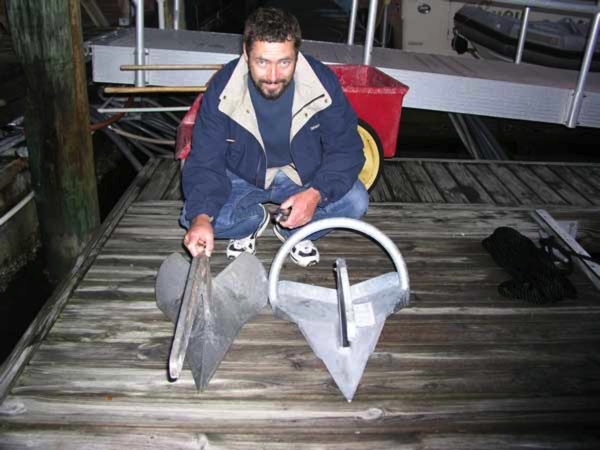 First of all, the Rocna is a 25kg anchor so it’s heavier than the Delta we replaced. I very much admire Rocna for standing up and saying they recommend a heavier anchor. 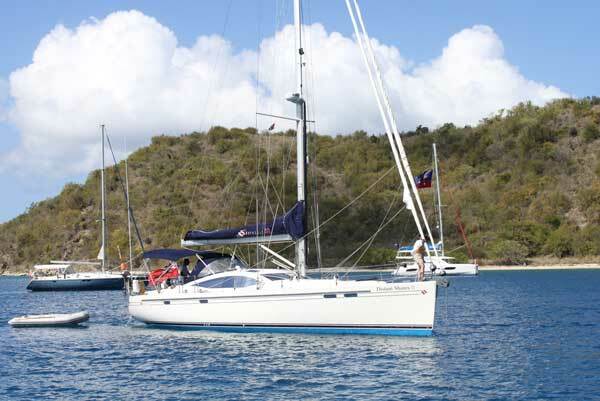 The Rocna people have actually sailed and anchored and know you need a serious dependable anchor on the bow of a cruising boat. 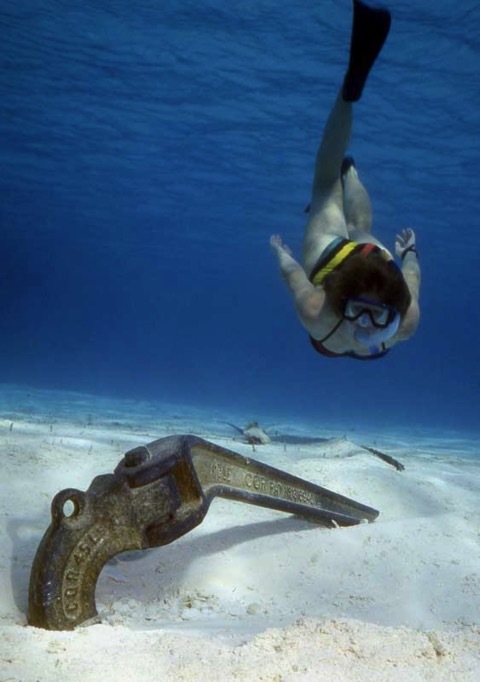 Most other anchors seem to recommend smaller lighter anchors but in small print they say it is for winds up to 25-30 knots - basically a day anchor/lunch hook. I think our anchor is probably our most important insurance! I can’t say why exactly but the Rocna seems to have conquered the gooey Bay Mud. It has never slipped here as we have tested it in a few anchorages. 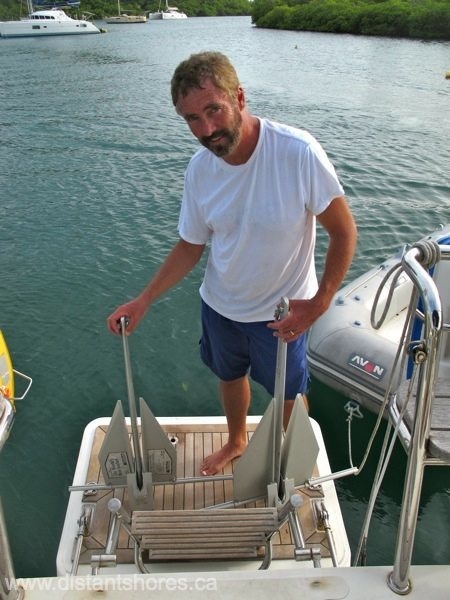 The toughest test we have tried is anchoring stern to a dock. In this case the Delta had slipped repeatedly. Now in exactly the same place the Rocna has been great. Once set in, it has held many times the force we achieved last year. Overall this is the best anchor we have tried and are happy to be putting one on the new Southerly 49. We are moving up to a 33kg (73 pound) version. 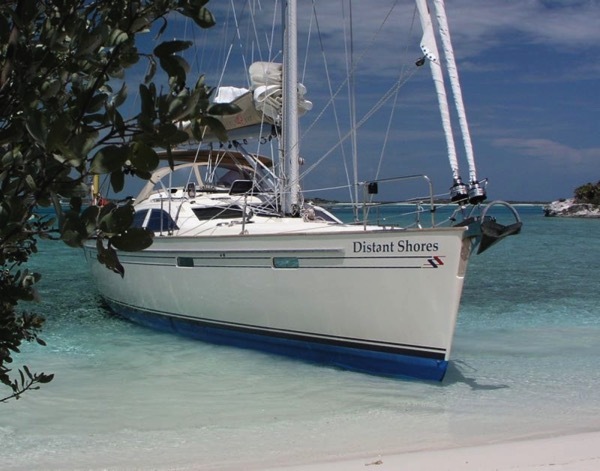 Here’s a shot of the Rocna 25 on our Southerly 42 in the Bahamas this past spring.